An entertaining, testy affair got Donegal and the Gaels off to their 2018 season start. Things got a little tense in the final 15 minutes as the game was on the line, Hugh Devine was issued a black card for a challenge on Coleman Mulkerrins, and a scuffle followed. At the time the Gaels led 0-9 to 0-8 after erasing a four point deficit. With the game on the line it was Hugh Yank Boyle who rescued a point for Donegal after moving from goalkeeper to outfield in the second half. It was the Gaels who sprung out to an early lead. Ryan Caffrey and Mulkerrins with 3 scores between them to one for Donegal. The northerners played some quick passing, running football for the remainder of the half, however. There was plenty of productive running from Lee Carr, Sean Donnelly, and Neil McEneaney. Brian Donnelly was holding midfield well, and Neil McEneany surged forward on occasion, one foray resulting in a point. Conversions also came from Carr, Darren Doherty, and the wily Christy McLaughlin. At the break it was Donegal ahead by 2, 0-6 to 0-4. The second half saw switches from each side, some forced due to injuries. The Gaels’ Caffrey had to leave the foray with an ankle injury and McEneaney suffered a head wound and had to withdraw from play. After Donegal had extended the lead by 2 more points after the restart, the Gaels replied with endeavor, and had overturned the deficit by the time we were at the mid-way point. Noel Graham took up a forward position and proved to be an effective target for the most part. The tension built in the run in, with McLaughlin leveling before Graham put the Gaels up one with full time almost up. Yank Boyle saved the day for Donegal with the equalizing point to send the teams back to the dressing rooms, each with a share of the spoils. The Shannon Blues will have been well pleased with their first outing of the season, Cork a little less so. The rebels played well at times, but missed plenty of chances to keep the Blues in sight. At the break it was an 11 point Blues lead and the second half was a matter of each side trying to get what they could out of this “preseason” game. The Blues looked the sharper side from the off, Mike Ralston showing some stuff from the glory days in the early going with a couple of well converted points from play. Denis McElligott found Ralston for an early goal, and writing was on the wall for what was to come. Cork generated some good opportunites that drifted wide of the posts, but with the Blues defenders awake and alert it was difficult for Cork to make a dent. Scores eventually did come, Ian Caffrey and Conor Jenkins converted, but the Blues then struck with a second goal to deflate Cork hopes of making inroads into the 5 point gap. Darren Wallace came into the game more, and there were some very well worked scores for Jack Kenny and Maurice Young to pop over. Brian Donnelly in possession for Donegal. Ian Caffrey opened the second half scoring with a point for Cork, but the Blues continued to dominate the second half and netted two more goals. Several switches were made to give a run to the players on the line, and the Blues had disappeared out of Cork’s view, over the horizon. Cork battled on, however, with some dogged displays from Jack Lynch and Steven Lambert, and two late points from Colm Caffrey frees topped off Cork’s tally. An easy win for the Blues, Cork might have deserved more from the game. 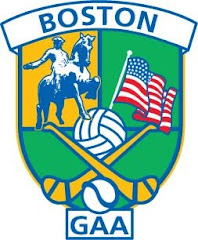 Camogie is coming back to the New England region with the Worcester Fenians camogie club. Practices are from 5-7 PM at 28 Sherwood Ave, Shrewsbury Ma. All experience levels are welcome to join. There are players traveling from Boston, so there may be an option to share rides. For more information you can find Worcester Fenians on Facebook or Instagram, or email contactworcesterhurling@gmail.com. The Boston Northeast division is sending 2 All American Teams to play New York development squad teams next weekend. The games are part of the celebrations around the New York v Leitrim Connacht Championship match. The hurlers play at 10:15 and the footballers at 11:45 at Gaelic Park in the Bronx.